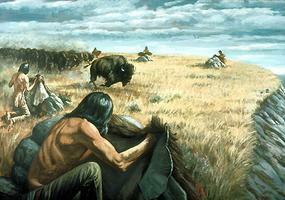 Foster, John E.. "Buffalo Hunt". The Canadian Encyclopedia, 12 April 2019, Historica Canada. 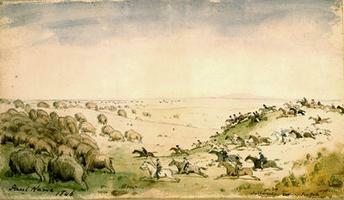 https://www.thecanadianencyclopedia.ca/en/article/buffalo-hunt. Accessed 23 April 2019. The buffalo hunt was the means by which Plains and Métis peoples acquired their primary food resource until the collapse of the buffalo, or bison, herds in the 1880s. The hunt was crucial to sustaining the fur trade activity that precipitated and supported European settlement. The buffalo hunt was the means by which Plains and Métis peoples acquired their primary food resource until the collapse of the buffalo, or bison, herds in the 1880s. The hunt was crucial to sustaining the fur trade activity that precipitated and supported European settlement. 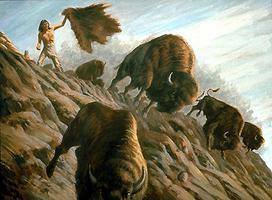 Buffalo were extremely plentiful in North America, with peak population estimates ranging in the millions. Single herds were described by early 19th century observers as including tens of thousands of animals, but by the late 19th century their numbers were in the low hundreds, to the extent that perhaps less than 100 remained. Hunters harvested the buffalo herds in a number of ways. They used stealth or subterfuge—by cloaking themselves in wolf skin or mimicking the cries of a bison calf—to get within bow and arrow range, or co-operated in funnelling the herd towards a cliff (buffalo jump) or a strongly-built corral (pound), permitting a larger kill. The Kainai, Piikuni, Cree and Tsuu T’ina stampeded the buffalo between two barriers (sometimes made of logs interwoven with brush) that led to a cliff or "jump." The buffalo plummeted over the cliff and were either killed in the fall or immediately butchered. For pedestrian hunters, deep snows or marshy ground hindered herd movement and enabled the hunters to close with their floundering quarry. Some hunters used smoldering buffalo dung chips to corral buffalo toward jumps or pounds, but regardless of the method used it was crucial to cut off a small herd section and avoid disrupting the movement of the larger herd. Archaeologists have documented a large number of jump sites. Perhaps one of the oldest is Head-Smashed-In Buffalo Jump in southwestern Alberta, now a United Nations World Heritage Site. With the introduction of the horse, about 1730, the ‘charge’ and the ‘surround’ became additional hunting methods, and the hunt became much more efficient. Within 40 years, mounted hunting was nearly universal; and by the 1780s the horse had become essential to life on the Plains. The use of the horse may have been critical to the near extinction of the buffalo, as it enabled hunters to move more quickly and efficiently. 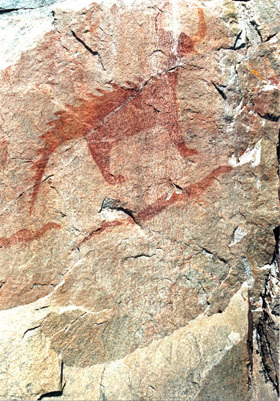 Aboriginal hunters primarily used the bow and arrow until it was largely usurped by breech-loading rifles in the 1860s. This increased hunting capacity, combined with the introduction of cross-country railways in the United States and Canada, and American policies that advocated for the extermination of the buffalo — meant to starve Aboriginal peoples into dependence — enabled industrial-scale buffalo hunting. In the 1870s, these conditions were met with a steady price for buffalo products, a lack of regulation of the hunt and new tanning processes that rendered buffalo hides a valuable commodity. These conditions encouraged massive slaughter in Canada and the United States, resulting in the near extinction of the bison. A number of conservationists saved the buffalo from extinction in the late 19th century by forming and protecting of remnant wild herds of plains bison in the United States. Sizeable herds were moved to Canada beginning in 1909, where they interbred with northern wood bison. The recovery of the bison has been slow, as disease and management issues made for a problematic 20th century. Now considered a near-threatened species, there are two free-ranging herds of plains bison and 10 wild populations of wood bison in Canada. Meanwhile, commercial buffalo farming has seen massive growth, with hundreds of thousands of animals providing products for consumers. 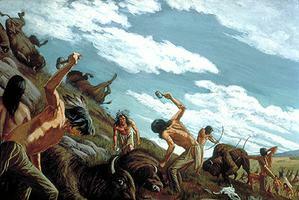 The hunt was the basis of the Plains way of life. Meat provided nutrition, sinew and bone became tools, and hides became clothing and shelter. The hunt and its products gave rise to, and supported, complex social, political and cultural institutions. 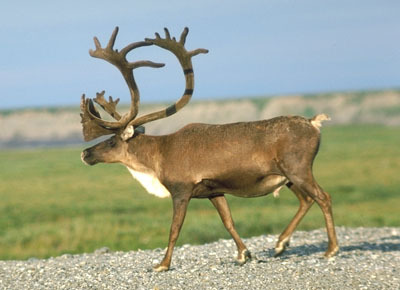 By avoiding disturbing the greater herd, hunters were able to use the same jumps and pounds several times, allowing for the establishment of semi-sedentary cultures . People who relied on the buffalo for nutrition pre-contact were much healthier than those who did not, and were hence much less susceptible to outbreaks of tuberculosis. 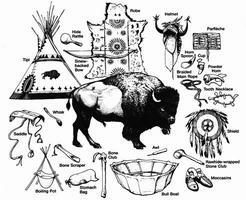 After the arrival of Europeans, bison were essential to the fur trade. Provisioning posts along the Red, Assiniboine and North Saskatchewan rivers acquired dried meat and pemmican, and fresh buffalo meat in season. Control of and access to the buffalo herds was a constant source of tension and antagonism amongst Aboriginal peoples, and between Aboriginal peoples and white settlers. Warfare was common, and as the herds dwindled, famine and disease pushed the plight of Plains peoples in parallel with that of the buffalo. The hunt that had once supported such vast and complex development had exhausted itself, and desperate Aboriginal communities accepted treaty terms from an opportunistic and unscrupulous Canadian government.